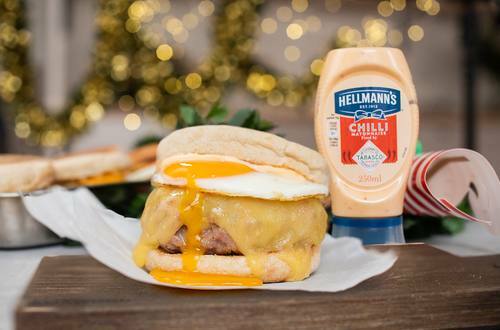 Seared pork patties, fried egg, spicy Tabasco mayo and melting cheddar - these towering, toasted English muffins might just be your meal on Christmas day. 1 Set the oven to 175c (fan) and set a frying pan to medium heat. Place the sausage meat and half of the chopped chives in a bowl and season as desired with salt & pepper. Mix well, divide into four and roll each 1/4 into a ball. 2 Place four cooking rings in the frying pan and, using a spatula, press the sausage balls into the rigs to form an even patty. Cook on both sides until piping hot throughout and remove from the pan. 3 Slice the muffins in half, lightly toast and place 4 half muffins in a baking tray. Layer each with a sausage patty and a slice of cheddar. Place the baking tray in the oven for 6-7 minutes, until the cheese has melted. 4 Meanwhile, return the rings to the pan and crack an egg into each, cooking until the white is set. Remove muffins from the oven and top each with an egg, the Tabasco mayo, the remaining chives and three muffin tops.